Kill a dragon in its lair. The bounty for the dragon. The location will vary. Any innkeeper, jarl, or steward can give you this quest. You will be directed to one of the possible dragon lairs in the hold. 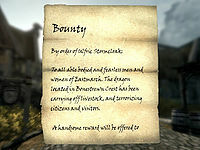 Speak with an innkeeper, jarl, or steward to receive the bounty. Kill the dragon at the indicated location. Speak with the jarl or steward of the hold to receive your reward. After your adventures at Whiterun's Western Watchtower during Dragon Rising, a proliferation of dragons are about. In your travels, ask an innkeep, jarl or steward for some work. You may learn that a dragon has been harassing travelers and citizens around its lair, and the jarl of the hold has put out a bounty on the dragon. You are an enterprising sort, with newly acquired dragon soul absorbing powers and shouts, so take up the job. Seek out the offending dragon in its lair. There is a wide variety of dragon that you may encounter in each lair you visit. Once defeated, and the dragon soul is absorbed, be sure to remove the dragon bones and dragon scales. These are quite valuable in the local shops, and can be used to make and improve dragonbone and dragonscale armor. Once the dragon is dead, you will be directed to the jarl or steward of the hold to receive your payment. If you are tasked to kill a dragon at a lair that you have already cleared, the dragon there will respawn. You need to have completed Dragon Rising first before receiving this quest. The dragon at Mount Anthor may not spawn, and the quest target will point to an incorrect location. Use the console command setstage BQ04 100 to skip to the next stage, or setstage BQ04 200 to jump directly to quest completion. On the PC, it is possible to use the console to advance through the quest by entering setstage BQ04 stage, where stage is the number of the stage you wish to complete. It is not possible to un-complete (i.e. go back) quest stages, but it is possible to clear all stages of the quest using resetquest BQ04.